Clive Powell Mountain Bike Centre Shop - SportsThe Bike Shop is run by Neil, who is a MTB enthusiast, a top mechanic and a generally helpful chap. Although the centre specialises in mountain bikes, they also do road bikes, leisure bikes, cyclo cross bikes and kids bikes. Clive Powell Mountain Bikes runs Dirty Weekends which are fully packaged mountain bike and road bike weekends. The Weekends are complete with accommodation, food, guiding and support and are run from Rhayader near the Elan Valley in Mid Wales, an area renowned for its spectacular dams and reservoirs. 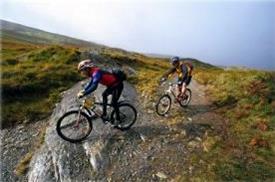 Rhayader is surrounded by open hills with some of the best mountain biking terrain in Britain. The Bike Shop is run by Neil, who is a MTB enthusiast, a top mechanic and a generally helpful chap. Although the centre specialises in mountain bikes, they also do road bikes, leisure bikes, cyclo cross bikes and kids bikes.